Yet again some information with examiners with their own test standards. During the course of this year 2013, i had found that examiners do not apply the correct test standard as set out by the Department of Transport. This happen at the Centurion testing Centre a few times, and one of my client had failed his test due to this. 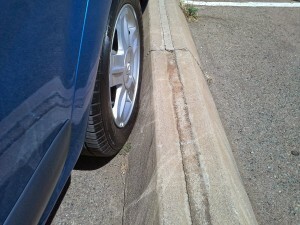 Apparently according some examiners, if an applicant “bump” the curb, the applicant will be failed for mounting the “curb”. More than ones i personally saw how an applicant had failed including my client. 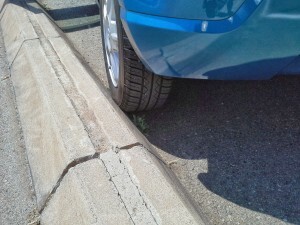 The examiner even go so far as to take a picture to proof that the curb had been mounted. I think that someone instructed them to do so? As instructors, we know that it is a penalty of 4 (four) against the applicant for “bumps” the curb, and not “mounts” the curb. 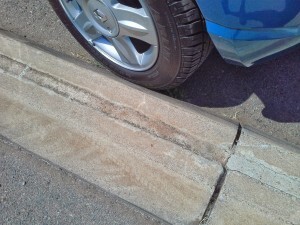 I attached a few photos, where one can clearly see that the wheel just bumped the curb and did not mount it. Would it be possible to find out from Pepsie if the examiners are correct, and if not, can he notify them of their misconduct. I do not think that an examiner needs a refresher course on this issue. Mount the curb clearly states that “at least one wheel must leave the road service”. Please comment on the photos and email below, as submitted by a SAIDI Member. I support him in this, since we have noticed for some time now that the examiners claim our students have “mounted” the kerb, even if they only “bumped” it. Despite the definitions in the K53 Manual, the examiners falsely accuse people and fail them for “mounting the kerb,” when they only bumped it. When at least one or more wheels of the vehicle is not in contact with the road surface but is on the kerb or sidewalk. When a wheel, tyre or any part of a vehicle comes into contact with the kerb. Please can we ask that the examiners stop failing applicants unfairly? The K53 standard is there to ensure a consistent standard, but we do not always experience that. It means at least 10 weeks delay for another appointment, and additional undeserved expense for our pupils. We get so frustrated when that happens! It is unacceptable. Please can we request that you mediate in this matter? I forward it to Japie Mbele that he can table it at the right forum to address the issue. We are waiting for a decision to be taken on this matter by the National Department of Transport, but the law is quite clear, and the examiners are not correct failing a student who barely touches a curb during their driving licence test. We have even had a failure for driving over a stone! The examiner claimed the applicant had driven over the curb. This was not true. After appealing, my student was re-tested and passed but the process took 22 emails and months of waiting before the matter was resolved. While we have no problem with fair failures, despite the disappointment, we object to having to go this route when well-trained applicants are unfairly failed. The ramifications are considerable. Umpteen emails are exchanged, and weeks of negotiations must take place. Suspicion is cast on the applicant’s integrity, and the standard of training he / she was taught. – All because an examiner does not know the correct standard!